Christ is the Prince of Peace (Isaiah 9:6-7). Christ's disciples were killed for their faith (Acts 12:2; 2 Timothy 4:7). Christ forgave and converted the chief persecutor (1 Timothy 1:13-15). Christ was the giver of life (John 10:27-28). Christ murdered none but saved many (compare John 12:48). Christ's aim was voluntary CONVERSION (Acts 3:19). Christ preached FAITH (John 6:29,35). Christ is a DELIVERER (Col. 1:13; 1 Thessalonians 1:10). Christ conquered his enemies with another kind of sword, the sword of the Spirit which is the Word of God (Hebrews 4:12; Acts 2:37). Christ said, "Believe and live!" (John 6:47; 11:25-26). Christ shed His own blood for the salvation of many (Ephesians 1:7). Christ prayed "Father, forgive them, for they know not what they do" (Luke 23:34). Christ achieved a holy victory on Calvary's cross (Colossians 2:14-15) and His followers share in that victory (John 16:33). Christ constrained people by love (2 Corinthians 5:14). Christians derive their inspiration from the One who said, "Blessed are the peacemakers" (Matthew 5:9). Modern day disciples of Christ are deeply grieved at past atrocities carried out by those who were "Christians" in name only (the Crusades, the Spanish Inquisition, etc.). Many Christians are peaceful and peace-loving because they do strictly follow the teachings of their Founder (Romans 12:17-21). The Bible is authoritative in many languages around the world, for God knows all things and can inspire His Word in more than one language. Islam calls on its followers to observe Five Pillars, while all other aspects of life can be vulgar and not affect the Muslim's prospects in Paradise. The Muslim looks forward to eternity in Paradise where there will be virgins who are used for eternal perpetual copulation. Christ ordered that the gospel be preached "to the Jew first" (Romans 1:16). The Bible says, "we wrestle not against flesh and blood" and "the weapons of our warfare are not carnal" (Ephesians 6:12; 2 Corinthians 10:4). Christ said, "Preach the gospel to every creature" (Mark 16:15). God inspires His terror into the hearts of believers (Isaiah 8:13). The Bible is a missionary manual to spread the gospel of peace to all the world (Romans 10:15). Christ's mission was to conquer sin's penalty and power by substitutionary atonement (2 Corinthians 5:21; 1 Peter 3:18). 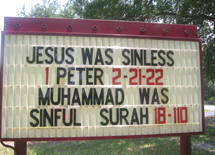 Christ pronounced Mohammed to be a false prophet (John 10:10; Matthew 24:11). Christ claimed that He was God (John 10:30-31; John 8:58-59; John 5:18; John 14:9). Those who leave the true Church of Jesus Christ are allowed to do so with no revenge. Now, is a Muslim submitted to Allah and Islam because he loves Allah? He dare not leave Islam, and he is loyal purely out of fear. The true Bible believer is loyal to Jesus Christ purely out of love. 1 John 4:18 There is no fear in love; but perfect love casteth out fear: because fear hath torment. He that feareth is not made perfect in love. 19 We love him, because he first loved us. This concept is 100% alien to Islam-- There is no love in Islam-- Only fear and hate.